The intervention zone is situated in the rural areas of the water basin of Lake George. In this area 28 % of the population lives below the absolute income limit, and 34,5 % in a situation of seasonal food insecurity. The livelihood of the fishing community depends entirely on the lake. The lake borders on the national park, a protected area where very little human activity is allowed. The lake is a Ramsar site, and a source for water, building materials and proteins for the whole region. 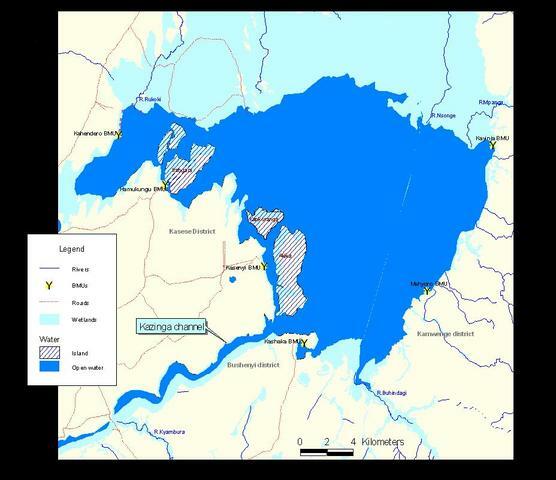 The target group is the rural community in the sub-counties Mahyoro and Nyabbani in the district of Kamwenge in Western Uganda and the fishing communities in 4 of the 8 landing sites on Lake George in the districts Kamwenge and Kasese. Currently the population in this area is estimated to be 48.250 persons. Access to drinking water in these sub-counties according to official figures is 37% in Mayhoro sub-county and 44% in Nyabbani sub-county. Supplying water to an additional 12.000 people will increase the coverage from 41% in the 2 sub-counties combined up to 66%. R1. 12.000 persons have sustainable access to drinking water in Nyabbani and Mahyoro sub-county in Kamwenge, and in 4 of the 8 landing sites of Lake George. R2. 7.500 persons in Nyabbani and Mahyoro sub-county and in 4 of the 8 official landing sites of Lake George know the importance of good personal hygiene, have a good understanding of the causes and consequences of HIV/AIDS and adapt their behavior. R3. Local implementing organizations, authorities and community representatives work together for effective planning, coordination and monitoring of the water and sanitation activities in the district. Construction of improved pit latrines and eco-san latrines. Community contribution in kind in unskilled labour and delivering sand and bricks. Strategies and approaches: multi-actor approach. The project is managed by a management team composed of the coordinators of PROTOS, JESE and FORUD. JESE and FORUD are local NGOs. The field activities are managed on daily basis by two team coordinators, one for JESE in Mahyoro sub-county and one for FORUD in Nyabbani sub-county. Planning and monitoring of the program is done jointly with the district and sub-county local authorities. PROTOS bears the final responsibility. Water Users Committees will contribute a yearly fee for using improved springs or a fee per jerrycan tapped water from shallow well handpumps or rainwater harvesting tanks. This will be sufficient for future repair and maintenance costs. In kind unskilled labour and delivery of sand and bricks. Not quantified. Have to agree with the others, this is a well laid out project and very ambitious, and a very reasonable request. 1 question, perhaps more for Rajesh and/or Annette - can we approve a 2 year project here? From the budget, the $25K is requested over 2 years about $12850 per year. If you ask me, I am all for it, just wondering about this since it is different from the other projects I have seen here online in this round. Not a question for now, but maybe in your next projects, you might want to quantify the community contribution, or at least make a rough guess. It is nice to see the community side, and volunteer labour definitely has value. How do you select the communities where you are going to work? Was pleased to see that this is part of a bigger initiative and so thought "well done". In most countries we operate, we try to integrate our programme in a integral water ressources approach. Looks like a good program. I'm not sure how busy this area is, but how do you ensure that the people who access the water have paid the annual fee? Getting Water User Associations always paying their fee, is an action to get fixed early 2008. This will be set up on a district level in conjunction with the District Water and Sanitation Committee, the technical support unit of Directorate of Water Development ( state organisation ), local authorities and local NGO's working with us on this programme. A great project, very holistic and well thought out. These ideas are not needed to be addressed at the application stage but hope to surface during execution phase. Population education is already an integral part of our programme and part of Result 2: hygiene promotion/training. This is done by the 2 local NGO's JESE and FORUD who are implementing with us the programme. Planning to get 100% coverage. As a first step, we are mapping the existing situation on pumps and improved springs. This will be introduced in GIS maps to compare it to habitants concentrations and land use. Those GIS maps will first be used to prioritize actions with communities and local authorities. Later on, they will also be our guide to get as close as we can to 100% coverage. The overall purpose of the proposed project (providing clean water services to 12,000 people and sanitation facilities to 7,500 people), thereby eliminating considerable a amount of potential pollutants (human feces, wastewater, and grey water) directly into the lake, certainly seems to be a reasonable and potentially worthy goal for BPR funding. Also of note is the fact that the implementing agency’s own co-financing, which is more than more than half a million USD, with the proposer is only applying for the relatively modest BPR amount of $26,000. This amount of proposed self-financing is unusually high and should be strongly encouraged amongst other people requesting BP are financing. 1) Overall Financing: The proposed total cost estimate of $538,573 means that the combined per capita costs for water and sanitation services is about $45 US. There is quite a mix of water supply technologies being proposed for this project, including improved shallow wells, spring catchments and rainwater catchment tanks, assuming that about 80% of the cost is for water ($36 per capita) and the remaining 20% is for sanitation ($9 per capita), and assuming that the construction is for good quality pour flush sanitary toilets with septic tanks, the costs appear somewhat low. To what extent are the proposed beneficiaries going to be required to co-finance the new infrastructure? 2) Latrine costs -Seem a bit on the low side. Typically a good quality pour-flush latrine with septic tanks with some privacy infrastructure will run about $100 in most Asian countries, but I am not familiar with African prices. $10 per head for shallow wells is not unreasonable. Similarly, $2,000 for 250 people ($8 per capita) for spring catchments (depending upon the length of pipe from the spring catchment to the distribution system with the service area) with a storage tank is also a reasonable price, depending upon whether or not any water treatment would be required. An appropriate cost for rainwater catchment tanks is difficult to say, largely because the size and therefore the cost is very dependent upon the actual amount of rainwater that can be reliably plan for, a figure with which I am not familiar. 3) Operation and Maintenance and Repair: The spreadsheet describing the estimated program costs does not appear to include any reference to operation and maintenance and repair costs for water supply facilities, unless that is the item labeled “General Functioning”. Who will be responsible for the operation, maintenance and repair, who will be responsible for training those persons, and where will the money come to finance those activities? 4) Water Operational Costs - Following from the previous paragraph, is there any intention to require water users to make any contributions whatsoever towards the long term operation and maintenance there replacement and potentially extension costs of the piped water systems, or the rainwater catchment systems? 1) Water Quality - There is no apparent mentioned of water quality issues in the proposal. This can be especially problematic given the fact that they the water sources are low capacity dugwells, the quality of which may not yet have been determined. This is certainly something that should be done before any final decision is made to implement this project. Is it not possible to provide greater percentage of the project beneficiaries with piped groundwater or spring water that would be treated before delivery to the beneficiaries? 2) Environmental Impact: The benefits of this project go well beyond the basic provision of water supply and sanitation services, to also include the potentially significant environmental benefits that would accrue by avoiding direct wastewater discharge into the lake itself. 3) School Water and Sanitation: There appears to be no mention of any school children getting water. I would assume that if there are any schools in the area, they would certainly be able to obtain water from one or more of the water systems that are being financed under the project. At minimum, there should be some protected dug wells available at all schools within the proposed project area. It should be required that all schools within the proposed project area have proper latrines (separated into girls and boys sections) that are easily accessible by both students and teachers. Post Construction Management – Is it quite clear who will be responsible for managing and maintaining all these facilities for the next ten years or more? Other than those issues, the project seems to be a reasonable use of BPR funds, but it would be helpful to more specifically address the long term financial sustainability issues mentioned above. Rick, thanks for your positive and critical reflections. Here are some answers on your questions. 1. Overall financing. About half of the General functioning and Staff costs in the budget are foreseen for setting up an integrated water ressources plan for the Lake George cathment area: cfr our R3 and R4 objectives of the program. Your calculation on average cost by beneficiary results by that at the high side. Beneficiaries are not asked to invest money in building the infrastructure; they are simply too poor in that area of Uganda. If they can, they provide local materials and manpower, but this is not quantified in the total cost of our program. 2. Latrine costs: the majority of infrastructure we will put is of the dry ECOSAN type latrines ( because the ground water level near the lake is quite high). They will mainly be put near public places: landing sites of fishermen, market places, schools... These are rather expensive 4-persons latrines in the area of 2000$ per piece. We count an average of 200 people making use of 1 public latrine. Besides that, we are developping with local people a lower cost ECOSAN latrine with cheaper materials, which we build near their home as "demo" places. Locals can/will copy the design and produce them theirselves near their home. 3. Operation and maintenance/ water operational costs: is not foreseen in our budget. However, we are making sure with local WUC's, our local partner NGO's JESE and Forud, with local authorities and state authorities DWD that people will pay a contribution per jerrycan tapped water, or a yearly fee for using improved springs, to cover the operation and maintenance costs for the next 10 years. This is being set up now at district level. Training how to operate and how to maintain is foreseen in our program, as well as the initial set of spareparts per infrastructure. The program foresees also construction of cheap rainwater harvesting tanks and training how to construct them, which can later be copied by local people. Local partner NGO's will be able to pick up the technology how to construct improved wells. They can multiply, if local communities can raise enough money later on. 4. Water quality. Our engineer has water quality test equipment. He will train our local partner NGO's how to use that. A quality monitoring system per pump and per improved spring is being set up. Piped groundwater system is not an option for this area: farmers living too spread around the hilly country , and fishermen near the lake living too far from safe springs. 5. Schools: are foreseen in the program, as well for water as for latrines. During and after project implementation, would like to see learnings coming out of the integration with NGOs and government, especially details on how challenges dealt with by many water programs (ie, achieving full payment) are addressed. What works, what doesn't? Great project and i hope the learnings get shared, so that even the components can be of use to other smaller, more focused projects.